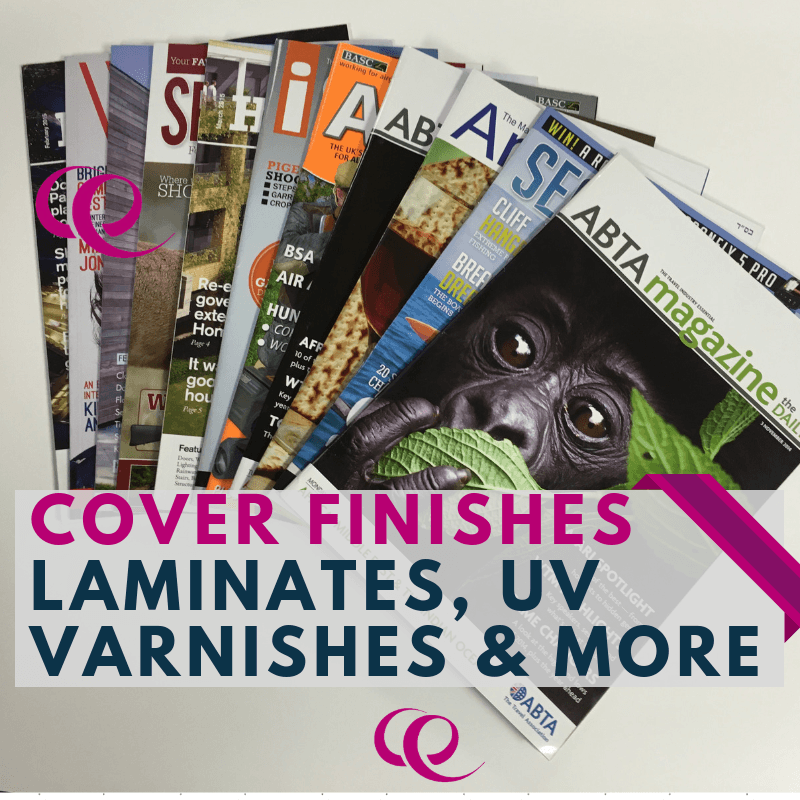 Cover finishes such as laminates and varnishes can add an element of quality, durability and creative individuality to your magazine, catalogue or brochure printing. Finishes can be done in-line as part of the printing process, particularly when using digital and web printing presses, or they can be finished off-line as a separate process. The following explains what laminate and UV varnish finishes are, as well as outlining some other decorative finishes that are available. Laminates are a thin layer of plastic which is applied to the whole of the outer cover of your magazine print product. These can be matt, silk or gloss in finish. Laminates add durability and some protection against spills and marks whilst preserving artwork. However, lamination cannot be spot applied and matt lamination over dark colours can show up finger marks. Polypropylene lamination is one of the most common and cost-effective laminates offering protection and strength and is available in gloss, silk and matt finishes. Polyester Lamination is more durable than polypropylene and offers a hard coating which offers heat protection and does not become brittle with age. Speciality laminates include metallic finishes such as gold and silver as well as holographic and iridescent films. Ultra violet (UV) vanishes are typically applied in-line and exposed to ultra violet light to harden it. It can be applied to part of a page (spot varnished) to enhance or reduce specific areas such as logos or images and come in a variety of finishes. When gloss UV vanishes are applied to dark, rich blues and black colours it can result in an almost wet look. A gloss finish will reflect the light whilst matt gives a smooth finish which doesn’t reflect the light and a silk finish is somewhere in the middle. UV spot varnishes can also be applied to specific areas and over laminates to create different visual effects. Textured varnish gives a slightly rippled effect and can be used as a spot varnish to enhance specific areas or as an overall finish. Neutral varnishes which are not visible can be added online as part of the printing process or offline, after printing to seal ink and artwork. More creative varnishes are also available including metallic or glitter, tinted colour vanishes and latex scratch off panels. There are a range of other finishes available which include embossing where an image is raised from the paper or card and debossing where the image is indented and tends to be used on thicker paper or card. Foil stamping is available in a range of colours and can enhance the look of your product and can be applied to more materials than ink. Foiling can also be used to enhance embossing and debossing to create visual and tactile finishes. Edge staining, where the edges of a book for example are stained in gold leaf.